My second post from this conference held during the Harvest Festival in Waterford (see the first one here). They are raw notes and I have not edited them a whole lot. M&D Bakery. They are in business 25 years and the Blaa is their main product. Started in the 1690’s with the Hugenots who set up an area behind Reginalds Tower known locally as New Geneva. One of the businesses there was a bakery and they imported French flour which was used to make Pain Blanc. 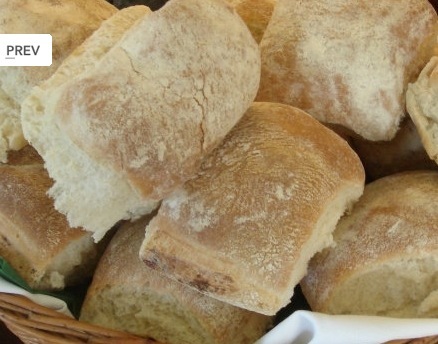 Leftovers from their main loaves were used to make smaller pans and it is believed that the Blaa was named as a shortened version of Blanc! They soon spread and in the 1800’s and 1900’s there were always 10 to 12 bakeries in the City with up to 15,000 blaas made each day. In the 1990’s the number of 9 dwindled down to only 3 still going in Waterford. Even with only 3 bakeries there are still 10,000 to 12,000 sold a day. He then explained how the Blaa was given a Euro-torque award and that lead to a lot of coverage for the Blaa and joining Good Food Ireland helped enormously. They took advantage of that and featured in the Galway Volvo Ocean Race Green Dragon blaa sandwich. After that (and the publicity which then followed) they extended to Electric Picnic, Oxygen and have recently been “listed” by the Guinness Storehouse as their sandwich bread of choice. They are now thinking beyond the regions and moving to baking and freezing to extend distribution nationally (which fortunately the Blaa is well suited for). In 2009 they were contacted about the idea of obtaining protected geographic status. They are hoping for PGI – Protected Geographic Indication. This would be a strong selling point for Waterford and would would be applied for by the Waterford Blaa Bakers Association. The point is to keep commercial blaa manufacture alive in the City so the status would be the beginning of the story. He shows a graph which showed the various countries which hold this designation – France and Italy have over 150 designations each. The UK have over 50. We (Ireland) have 4.